Plasmonic nanostructures have been shown to possess extraordinary optical properties. In the case of solar energy collection using photovoltaic (PV) cells, the main challenge in direct utilization of plasmonic resonance absorption of solar energy in the visible range is significant Ohmic losses and heating. An attractive solution is to utilize solar thermo-photovoltaics (STPVs). 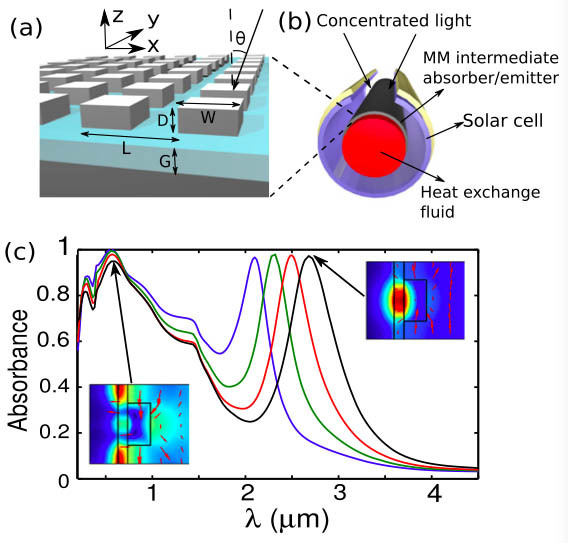 Broad-band absorption of the solar radiation is re-emitted from the SANTE film into a narrow IR band determined by the structural dimensions of the imprinted plasmonic structures (see figure 2 (a) (c)). The emitted narrow-band IR radiation can be efficiently coupled into a separate PV cell positioned coaxially with the SANTE film to maximize the power conversion efficiency. In the SANTE device, the top layer consists of a patterned refractory metal (tungsten), whose feature dimensions define the plasmonic coupling frequency and narrow-band emission. Two designs with the emissivity peaks tuned to λ ≈ 2.5 μm (see figure 1: lower-temperature emission) and λ ≈ 1.9 μm (see figure 2: higher-temperature emission) are presented. To highlight the thermal insulation capability of the SANTE film, its equilibrium temperature is calculated as a function of the solar concentration and compared with that of a black-body emitter (see figure 2 (c)). Figure 1. Illustration of the concept of an integrated solar absorber/narrow-band thermal emitter (SANTE) film based on large-area nanoimprint-patterned plasmonic structures. The structure of the SANTE film consists of a high melting temperature dielectric (e.g. AlN) deposited on a refractory metal foil such as tungsten. In figure 1 (b), concentrated solar radiation is directed to a cylindrical core wrapped with the SANTE film. The SANTE structure is using high-loss (low reflectivity) refractory metals (e.g., W or Mo), because it combines broad-band visible (solar) absorbance with narrow-band thermal emissivity in the infrared. Figure 2. 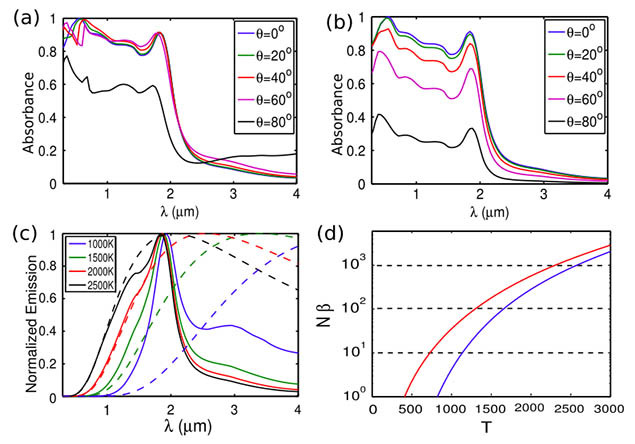 Numerical demonstration of the wide-angle absorbance spectra of the SANTE film for (a) p polarized and (b) s polarized incident radiation for various incidence angles. (c) Normalized thermal emission spectra (per unit frequency) for black-body (dashed lines) and SANTE (solid lines) surfaces. The different colors correspond to different emitter temperatures. (d) Solar concentration versus equilibrium temperature for the SANTE surface (right) and a black body (left). The dimensions of the SANTE structure are given in nanometers for [L,W, D,G] = [330,176,80,35].